Tata Harrier deliveries have started across India. It is offered in a choice of 5 colour options – Calisto Copper, Thermisto Gold, Ariel Silver, Telesto Grey, and Orcus White. But, none are dual tone colour options. Neither the official website mention anything about a dual tone colour option. Somehow, a dealer in Mumbai, has delivered a dual tone Harrier (white exterior and black roof) to a customer. Tata Harrier imaginator option allows you to add decals on the roof, but in the case here, the roof is painted in piano black, and so are all the pillars. Even the ORVMs are all black. In the single tone White colour option, the ORVMs are dual tone. We spoke with the dealer, who confirmed that it is a dealer level mod. 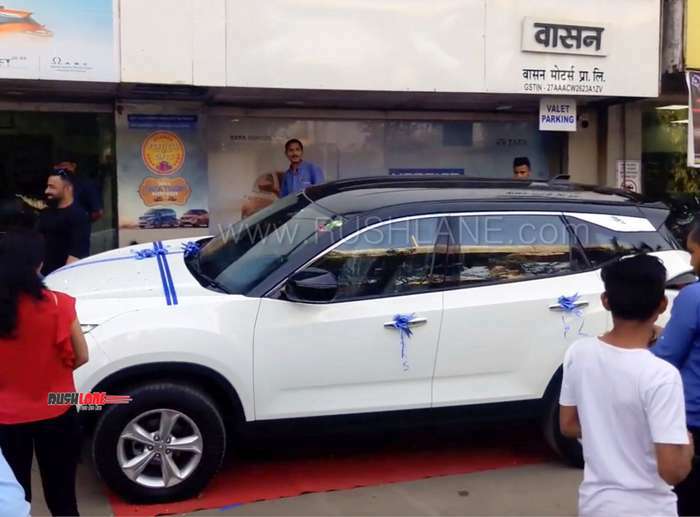 For the same, the customer was charged Rs 40k, over and above the total cost of the SUV. Watch the video below where the customer is seen taking deliver of Harrier white colour with black roof. Tata Motors is betting big on Harrier and there may be plans to launch the SUV in international markets as well. It has received a good response in the Indian market, where waiting period is already three months. Harrier comes with a host of compelling features that are difficult to ignore. Moreover, Harrier is competitively priced in the range of Rs 12.69 lakh to Rs 16.25 lakh (ex-showroom). Harrier utilizes Optimal Modular Efficient Global Advanced Architecture (Omega Arc), which has been derived from Land Rover’s Legendary D8 Architecture. More than 1 million SUVs globally utilize the D8 architecture. Harrier has undergone rigorous testing on torturous terrains for more than 2.2 million kilometres, which highlights its superior build quality and toughness. Harrier is powered by Kryotec 2.0 L turbocharged engine that delivers max power of 140 PS @ 3750 rpm and max torque of 350 Nm @ 1750-2500 rpm. Engine is BS-IV compliant and comes mated with 6-speed manual transmission. On-board the Harrier, there’s an 8.8 inch floating island touchscreen infotainment system supporting Android Auto and Apple Car Play. Acoustics are powered by JBL and theatre-like experience is achieved through 9 JBL speakers. Below are the company offered colour options of Harrier.